Defence issues in the news today include calls for the Army to help secure Calais, follow up coverage of Army numbers, and the confirmation of the death of Taliban leader Mullah Omar. It is widely reported that demands are growing for Britain to send in the Army to secure our borders as the Calais illegal immigrant crisis continues. Some MPs, backed by Brussels, say the Army should be sent in to restore order because the French authorities have lost control. There are also calls in Westminster for the Tunnel to be shut. The Sun and The Daily Telegraph carry comments made by Kevin Hurley – the police and crime commissioner for Surrey – who called for the Gurkha soldiers based at Folkestone’s Shorncliffe barracks to be sent in. The French police have obviously been providing security, and the French government has ensured that, actually, extra police have been available at Calais and Coquelles to deal with this issue. One of the questions we’re looking at and one of the things we’re doing is pressing to ensure that we can get the security fencing up as quickly as possible, to ensure that we reduce this problem. A number of the papers have followed up on yesterday’s story about Army manning. The Financial Times reports that so many soldiers have left the Army in the past five years that the UK is now 3,400 short of even its reduced manpower target. The FT is using our published manpower target figure; however, this number simply reflects the planned changes in the Army structure as we transition towards the end of the decade. It is neither a target we are seeking to man to nor an indicator of what resources we actually need. We have set out our plan for an Army of around 82,000 as part of our vision for the armed forces in 2020. The Telegraph quotes an Army source saying poor morale and slow recruiting mean numbers have fallen faster than expected and are likely to fall further still. We recognise that recruitment is a challenge; we have a growing economy and that means increased competition to recruit – including in key areas like engineering. We have to rise to that long term challenge and we are taking significant steps to do that, including cutting some of the bureaucracy around hiring so it is easier and quicker to get people on board. Equally, it means continuing continually striving to ensure our people feel valued and that their contribution and sacrifice isrecognised. That is why we enshrined the Armed Forces Covenant in law and have put our people at the front and centre of policy making and delivery, as evidenced by a raft of measures to improve Service life, from improved welfare support to the £200M Forces Help to Buy scheme. More remains to be done, improvements are currently being made through the development of the New Employment Model which aims to produce a modernised offer that reduces the impact of Service life on individuals and their families. Taking a slightly different angle, The Times also reports that the Royal Navy is also sinking below its reduction target in a worrying sign for naval commanders with new ships and submarines about to come on line. The Royal Navy is committed to a range of innovative measures designed to address nationally acknowledged challenges in recruiting and retaining engineering and technical expertise in a highly competitive employment market. These measures are already producing results allowing the Royal Navy to continue to deliver maritime capability where it is needed. There is widespread coverage of yesterday’s announcement by the Afghan government that Taliban leader Mullah Mohammad Omar has been declared dead, ending years of speculation over his whereabouts. The brief statement said Omar had died two years ago in Pakistan. It is reported that the declaration raises fresh questions over efforts to negotiate an end to decades of war. The Taliban is neither conforming nor denying his death. The White House says the report is credible and urges the group to use the opportunity to pursue peace talks with the Kabul authorities. Afghan president Ashraf Ghani hails the news as a breakthrough and urges the insurgents to "seize the opportunity and join the peace process". However according to The Guardian some analysts warn that Omar's disappearance could prove a serious risk to the peace process because a hidden leadership struggle could fragment a group already riven by internal disputes. 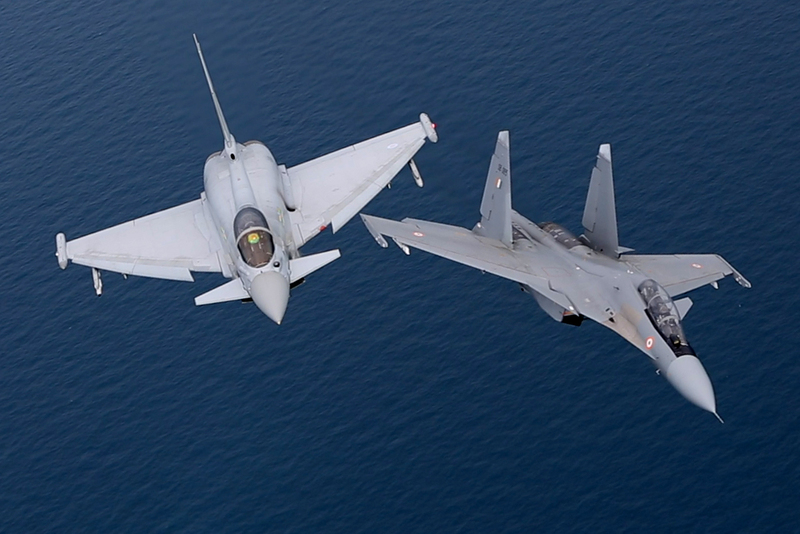 A Royal Air Force Typhoon and an Indian Air Force Flanker flying together on Exercise Indra Dhanush. Royal Air Force and Indian Air Force (IAF) aircraft are dogfighting in a major airpower training exercise in the skies above Britain.